It’s a pretty straight forward command, GO! “Go therefore and make disciples of all the nations, baptizing them in the name of the Father and of the Son and of the Holy Spirit”, Matthew 28:19. Since we’ve been commanded to go, we need permission in order to be excused from going. Unless you’ve received special permission not to go, you better find out where God is sending you. Jesus left the comforts of heaven and His place at the Father’s right hand to come to earth and He became our substitute on the cross at Calvary. He told His disciples to go and acknowledged that many excuses would be given for why they couldn’t. The lame excuses that were given 2,000 years ago are the same ones we try to use today. Have to care for elderly parents (Luke 9:59–60). Need to get everything in order first (Luke 9:61–62). Must know what I’ll be doing before I commit to go (Luke 9:57–58). Enjoying success where I am (Luke 5:1-11 & Acts 8:25-40). Do any of those sound familiar to you? It’s much easier to go when we don’t have family to take care of, I get that. But it doesn’t excuse us from going if He has called us. Waiting till everything is in order doesn’t excuse us from going when God calls either. Delayed obedience is still … disobedience. We can’t always know the details concerning the how, when and where of our call in advance. Many times those things aren’t shown to us until we’ve said yes to Him. A successful ministry can be one of the greatest hindrances to going where Jesus wants us to go. We may try to excuse the call to go elsewhere if we are comfortable and our current ministry is going well. Jesus hasn’t given us permission to be excused from going where He leads. We are to follow hard after Christ and He determines the timing and direction. We are to adjust our lives and obediently go as He has commanded. Have you adjusted your life to follow Him? Or would you prefer He make the adjustments? He may lead you next door to share the gospel with your neighbor or to the other side of the world. I’ve heard it said, “if it is important to you, you will find a way, if not, you’ll find an excuse”. Nothing is more important than taking the gospel to lost people in obedience to Christ’s command for us to go! 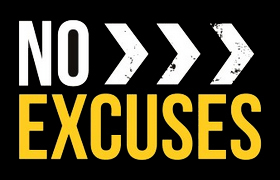 Will you go with NO EXCUSES whenever and wherever He sends?